You are likely familiar with stories, perhaps from a movie or a book, where a human connects with an avatar or a computer generated semblance of human form. There are stories of people leaving their human spouse to marry an avatar. That’s not my story but recently I did find myself feeling some kinship with Siri, the voice activated assistant on my iPad. Apple says of Siri “Its wish is your command”. On days when I think I have extra coordination, I use the metronome installed on my iPad to see if it’s at all possible for me to keep time. During one practice recently when I had made my umpteenth mistake, the metronome app got tired and went to sleep. Rather than waking up the metronome, in error I pressed the button that activates Siri. Up came the little wavy bit with a phrase along the lines ‘how can I help you?’. I said “Siri, help me play the accordion”. And Siri’s reply? “I’m sorry. That’s beyond my capabilities at the moment.” Me too, Siri, me too. P.S. I have moved on from expecting a mistake free, anywhere close to the right tempo version of La Donne E Mobile to learning Oh Susanna. Currently I play it at the tempo of a death march. Three months into accordion lessons and it’s an experience in humility. I have moved on from Book One and its byline “congratulations on buying your child an accordion” . From Book Two I have been playing La Donna E Mobile. I’ve played that song 120 times (at least) and think I must have 240 times left to go before it is recognizable. I am enjoying the experience and the lessons. The slow progress not so much. A few weeks ago my friend and I went into an antique furniture store. And there was an accordion sitting there. 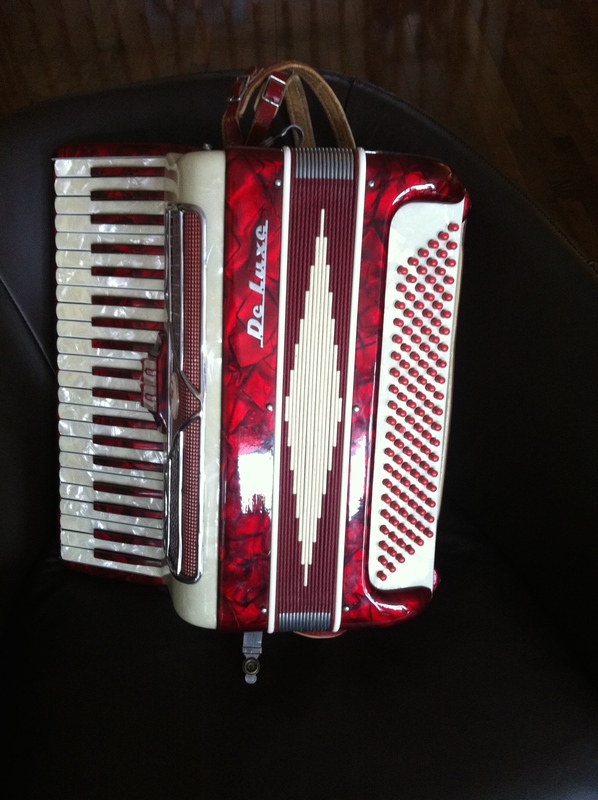 A beautiful red accordion. It was a larger accordion than my purchase of a few months and you know, it makes sense to have more treble keys and more bass buttons, doesn’t it? Doesn’t it? And it was red, that pretty vintage accordion. I hemmed and hawed and went back a few days later and well, I couldn’t resist. When I told my accordion teacher what I’d done, he said I had GAS-Gear Acquisition Syndrome. I’m looking for a case for it now and maybe I should acquire one more model at some point. You know a little beater accordion I could play at our community garden. We could conduct an experiment to see if plants respond to a haltingly played version of La Donna E Mobile. I have had six lessons on the accordion. Coming back to playing an instrument after decades and decades of not….well let’s just say, except for knowing which way was up on the accordion, there was little else I remembered. Here are some lessons I have learned/insights I’ve gained/questions that have arisen for me in these early days of accordion playing. I am sure you come at it differently as an older adult compared to taking lessons as a child or teenager. Question: Who, in their right mind, would design an instrument where you pushed buttons with your left hand and played ivories with your right hand. It’s like the proverbial rubbing your stomach in a circular motion with one hand and patting your head with the other. To top it off you can’t see what you’re doing with either hand. It’s an adjustment, when you are a point in life where you might be considered fairly competent at a thing or two, to put yourself in a spot where you are inept at almost everything. You have to leave your pride behind…or perhaps it is more about being at a stage when you don’t give a damn when you open Book 1 of the Palmer Hughes Accordion Course and read: Dear Parent, YOU HAVE A RIGHT TO BE PROUD! Giving your child music training shows foresight and appreciation of a fine art. Be ready for some teasing. Our daughter was over a couple of nights ago and I played for her for the first time. After I made it through the “The Can Can”, she said “they’d be kicking pretty slow”. Nonetheless it’s a lot of fun and I have a teacher who makes it fun and is not tied to book learning. He’s good with “off roading”, which sounds very bohemian. Maybe I was playing a Bohemian Can Can. I’m all ears for stories about learning an instrument. Inspirational stories that say you need to play a song 200 times before you get the hang of it would make me feel better. I’m up to 30 times with one song there is no smooth playing in sight.